Bristlenose Catfish are one of the most sort-after tropical fish asked for in an aquarium shop. These fish are fantastic in a tropical aquarium mainly because the will keep it clean by consuming all the algae off the glass, plants, rocks or ornaments. Origin : South America – originating from rivers and floodplains throughout the Amazon River. Prefer a planted tank. Add some driftwood plants to help create their natural environment. Driftwood is good especially for young Bristlenose due to them sucking on the wood which can be beneficial for their development. Bristlenose are vegetarian to omnivorous and require vegetable matter in their diet. Sinking algae wafers or pellets are ideal. 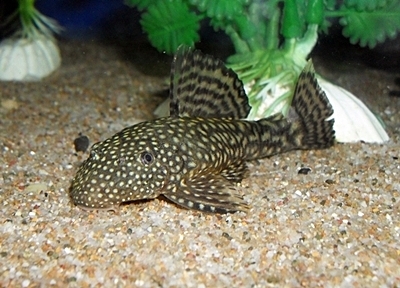 Bristlenose catfish also readily feed on vegetables such as squashed peas, cucumber, zucchini, pumpkin and lettuce. You are able to skewer these vegetables on a teaspoon to get the vegetable sunk to the bottom of the tank. Male Bristlenoses can be identified by their “whiskas” around the mouth area; Females do not have whiskas. They will breed when they are 6cm-7cm in length. Bristlenoses are egg layers and easy to breed. A cave or “Bristlenose Log” should be placed in the tank after conditioning of the fish with plenty of high protein food (such as bloodworm) and a varied diet of vegetables. 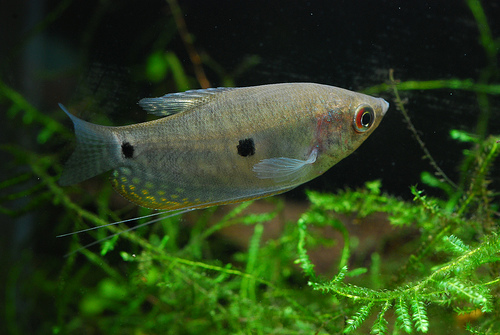 A 75% water change can induce the fish to commence procedures, where they will mate in a cave, before the male will “fan” the eggs with his large tail fin. He will protect the eggs – not letting any other fish near the cave for 10 days during which the fry will hatch and feed on their egg sacks. 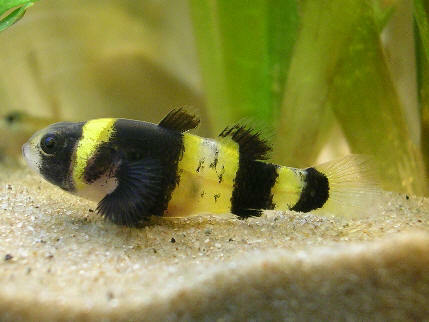 The young fry should be removed and placed in another aquarium – using water from the existing aquarium. This wonderful bottom-dwelling fish is peaceful and unique, but above all, they vacuum up algae from the tank!! Apart from cleaning the tank for you, this fish also will happily eat any dead fish, however this practice should not be encouraged. Bristlenoses generally inhabit the lower strata of the tank, often hiding in a cave by day, only coming out at feeding time. Bristlenoses are more active in the evening and may be shy when first introduced into a new aquarium. They are compatible with most Tropical Fish as well as African Cichlids and generally are very hardy, often living up to 12 years if well cared for. They can live in a PH of 6.0 – 8.0 and prefer a temperature of 26 C.
Bristlenoses are generally fed sinking algae wafers in the aquarium, however their diet should also include vegetable matter like cucumber, squash or shelled peas that have been boiled and softened. Bristlenoses require many hiding places and prefer a well planted tank. They especially like caves, nooks and crannies to hide. Bristlenoses should be offered a piece of driftwood to chew on – juvenile Bristlenoses especially need driftwood to chew on for their proper development.